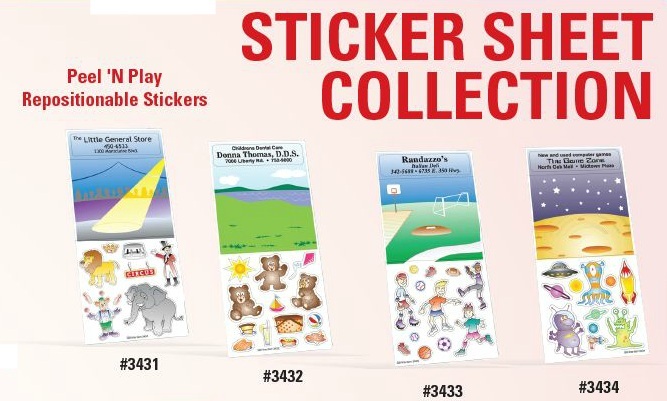 Medical and Dental Offices LOVE our personalized Sticker Sheets to give to those good little patients! 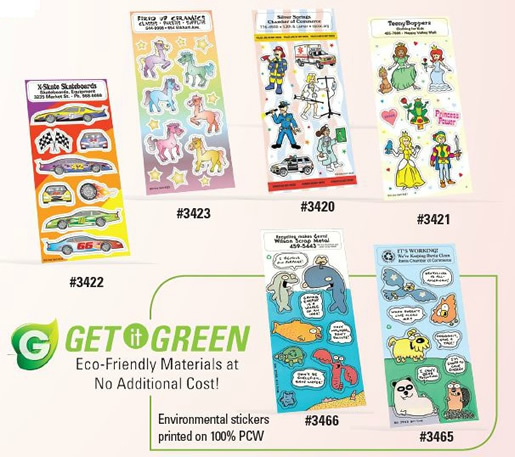 Print your custom copy on each sheet of stickers which prints in black ink. Imprint area is 1/2″ x 2-3/4″. You can add an optional back black imprint (for an additional cost) to any sticker sheet. Personalized sticker sheets measure 3-1/4″ x 7″ and fit nicely into a standard #10 envelope. An additional $15 non-refundable artwork charge is due before work can begin. Sticker sheets print on white gloss paper (permanent adhesive). Colored stickers are standard and as shown. Personalized copy prints in black only. Create different scenes with these repositionable stickers for hours of endless fun! Sticker sheets are 3-1/4″ x 7″ with a 1/2″ x 2-3/4″ personalized imprint area on the front available in black only. Add an optional back black imprint (for an additional cost) to any sticker sheet. Peel ‘n Play Sticker Sheets print on white gloss paper with repositionable adhesive.